If you’re looking for a good massage chair, go for the Panasonic EP30007 Real Pro because it is the only product in the market that is formally endorsed and supported by American Chiropractic Association. This fact alone shows how well the chair performs and how great its specifications are. Below is a complete review of the EP30007 massage chair. The Panasonic EP30007 Real Pro massage chair is not the most costly massage chair available in the market, on the other hand, it is quite affordable. The most special feature about the product is its unique combination of several different massage techniques as well as the good numbers of valuable features. Panasonic is a well-known brand that everybody trusts. However, the company is primarily known for manufacturing electronic appliances and they are in fact one of the leading manufactures in the massage chair business. They have a unique blend of traditional Eastern medicine alongside Western technology that sets them apart from the rest of the crowd. Shoulder Massage – Since we often carry too much tension in our shoulder and neck muscles, this form of massage is the best way of relieving the tension. Shoulder massages will leave you feeling physically and mentally rejuvenated. Arms and Hand Massage – Air compression massage conducted on the arms and hands will help improve blood flow and at the same time it will help relieve pain and tension as well as reduce fatigue in the area. Calf Massage – This is a great feature which is meant to relieve muscle tension as well as increase circulation in this area of your body. Foot Massage – There is no better feeling one would get after a tiresome and stressful day at work than a proper foot massage. This massage chair uses air cell to hold and squeeze your feet which in turn provides you with a relaxing massage. Stretch – The stretch function found on the chair is great for improving blood circulation and flexibility in the arms and legs. This type of massage will leave you feeling re-energized and well-rested. Acupuncture Points Massage – This is one of the most important and strongest functions of the Panasonic EP 30007 massage chair. As you already know, the human body has a total of 350 acupoints (in which approximately 100 of them are situated in the neck and back). 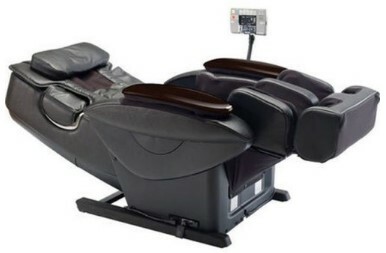 This massage chair provides its user with a wide range of techniques that are all meant to target the said acupuncture points, offering ultimate pain relief and at the same time reinvigorating the whole body. However, this kind of massage not only influences the body, it also influences the mind and helps to relieve anxiety and stress. Body Scan Technology – The EP 30007 massage chair uses a cutting edge body scan technology that generates a “virtual map” of your back. This feature allows the chair to perform highly personalized massages which target specific points and various groups of muscles in the body. Junetsu Massage – Junetsu (translated from Japanese which means kneading) is a form of massage that delivers a similar experience to what you would receive from a high end massage parlor that was conducted by a professional massage therapist. This form of massage mainly relies on the circular movements of the thumbs performed by a trained Junetsu massage therapist. Junetsu massages are used to loosen up tight muscles as well as relieve tension from the body. The Panasonic EP30007 massage chair doesn’t have a large number of ostentatious features, but the ones it has are good enough to provide you with a high quality massage experience. The massage chair’s strongest points are brought about by 3 features namely: Body Scan Technology feature, Junestu Massage feature and the Acupuncture Point Massage feature. Having said that, all the said features perform very well, but the 3 strong point features are what elevate the whole massage experience taking it to another level. 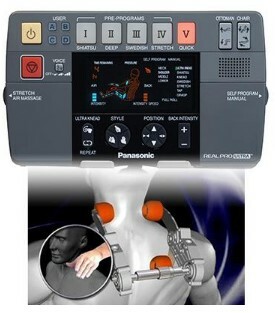 The Panasonic EP30007 isn’t just recommended and endorsed by the American Chiropractor Association for no particular reason because it functions and delivers the kind of massage that you would get from a professionally trained acupuncturist or Junestu massage therapist. The massage chair can be operated without any difficulties so you won’t have a hard time with this model. It has a well written user manual and the remote control isn’t complicated and is easy to use. If you’re looking for a massage chair that will help you unwind and relax after a stressful and tiresome day at work that will also preserve and improve your health in general, you don’t have to continue looking because the Panasonic EP30007 will be perfect for you. However, the chair isn’t a budget brand and given what it offers, it has a very reasonable price. This is because the chair has the same price range which is similar to what you would spend in about 30 hours of professional massages. Although the Panasonic EP30007 massage chair may prove to be completely perfect for most people, it is not meant for everybody. This is not because the chair doesn’t have enough features or it doesn’t perform well, but it simply doesn’t accommodate all body types. The recommended height range is 4’6” to 6’1” meaning if you are taller than 6’1”, the chair cannot accommodate you plus you won’t be able to make use of and enjoy its function. The Panasonic EP30007 Real Pro Massage Chair is one of the company’s top selling products especially for 3 major reasons: it is quite affordable, it is easy to use and it works well. The massage chair also doesn’t have any flaws, apart from the recommended height range which is limited to 6’1” making it the wrong choice for anybody who is taller than that. Apart from that, the Panasonic EP30007 massage chair is the perfect model that will help you unwind and relax. Rinnovimedicalspa.com is a participant in the Amazon Services LLC Associates Program, an affiliate advertising program designed to provide a means for sites to earn advertising fees by advertising and linking to amazon.com. Amazon and the Amazon logo are trademarks of Amazon.com, Inc, or its affiliates.